Searching for a specific photo of "Balok"
Discussion in 'Star Trek - The Original & Animated Series' started by Redfern, Sep 14, 2018. Noy that I warrant it, but maybe someone is willing to assist me. 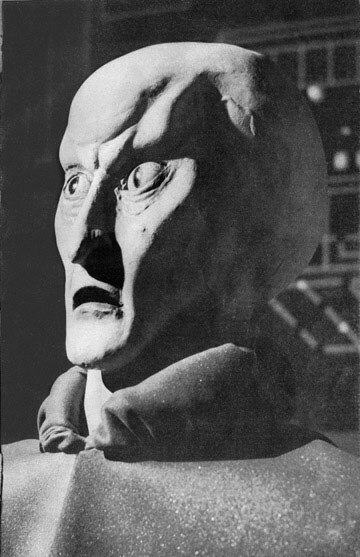 I'm trying to find a JPEG or GIF of a specific photo depicting the Balok "puppet". It's the grey-scale "three quarter" shot that appears in Stephen Whitfield's "Making of Star Trek". This image was used by model kit company AMT when it released the "Exploration Set" in 1975. Printed as a water slide decal, it was meant to be applied to the display screen of the tricorder. No, I don't have the model kit needing a replacement decal, but I do intend to use it upon a digital, wireframe version of the device as a humorous nod to the old model kit. So far, my "Google Fu" has failed me. Hopefully someone has a link to a scan of that photo. I certainly appreciate the effort. Yeah, that's how it looked upon the plastic model kit/cosplay toy. Hopefully someone can locate a scan of the original photo. I can't locate my copy of Making of Star Trek. Do you have the book? What is the quality of the photo as it is shown in the book? Perhaps you could scan it and use that version. Yeah, I have the book itself. However, the two groups of 32 photographic pages are located near the center of the 414+ page volume. One would almost have to remove the leaf from the book to get a decently flat scan. That's what I'm hoping to avoid, tearing apart the book. I've often run across copies of TMoST in used bookstores. You can probably find one in decent shape for cheap. How large of an image do you need? What resolution? I gather that taking the above jpg and cropping it to just the Balok graphic is out of the question? It's interesting that Balok appears to be in front of that engineering circuit board on the Enterprise. It's the same set piece. It was first used in "Corbomite" and wasn't seen as part of Enterprise engineering until two episodes later in "The Enemy Within." I don't think it's the same image as the one in TMoST. It's similar, but not identical. ZapBrannigan and Redfern like this. Yeah, that "tricorder" image is maybe 15-20 degrees more head-on. Ah, so Starfleet acquired First Federation technology and integrated into starship systems! I did mention in DTI: Forgotten History that the Enterprise had gotten some components from Balok to help repair the damage sustained in their escape. I wish it had occurred to me to include the status board among them. But then, we saw other alien cultures in TOS with inexplicably Starfleet-like technology, like the Eminians and the Fabrini. 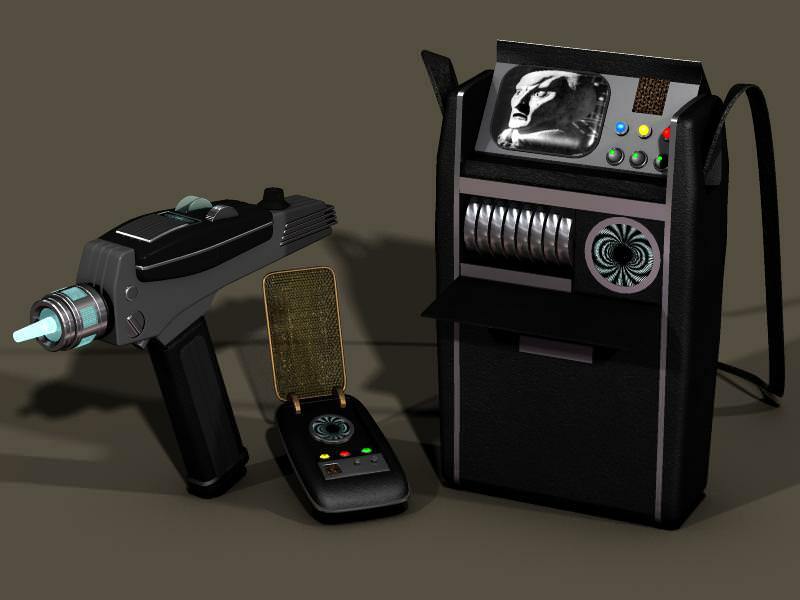 And some of the same consoles and gadgets showed up on countless worlds, like the "half-moon" console that was used in Landru's conversion center, the Romulan cloaking device station, the Elba II control room, and elsewhere. Thanks, Alchemist! If not exact, it's certainly good enough for my purposes! As for the status board, one might argue the First Federation "nicked" it from whomever set up the "lithium cracking station" on Delta Vega, as that's where the set piece was first used. One can clearly see in in that main control center behind Kelso when he is telekinetically straggled. I wonder if the similar technologies found among different civilizations was ever given an 'in-universe' explanation or even a passing acknowledgment in any of the novels. Let me know if you need a higher resolution image of it. Alchemist and you are correct. Having now returned home, I've been able to examine the photo in Whitfield's book again. What Alchemist has shared is indeed the photo from the book, but the decal image is slightly different. Aside from the slightly different angle of the puppet's head, the decal reveals more of the status board to "our" left. The MoST photo is just about pitch black in that region. Please, please don't think this is any kind of complaint! I'm just admitting I thought both images were the same all these years. But now I see I was mistaken. Anyway, I've saved the scan Alchemist provided and I'll crop it to better fit the display screen of the digital model. I hope not. It's best not to take such production limitations too literally. What we saw on TV was only an approximation of what they wanted to convey, made imperfect by budgetary and logistical limits. Prose fiction is free of those limits and shouldn't feel compelled to adhere to them. Here's the final effect. Even cropping a bit at the top and a larger strip at the bottom, I knew there would be some horizontal stretching, but I realized that from the "portrait" orientation of the original photo. The most screen accurate item is the communicator. 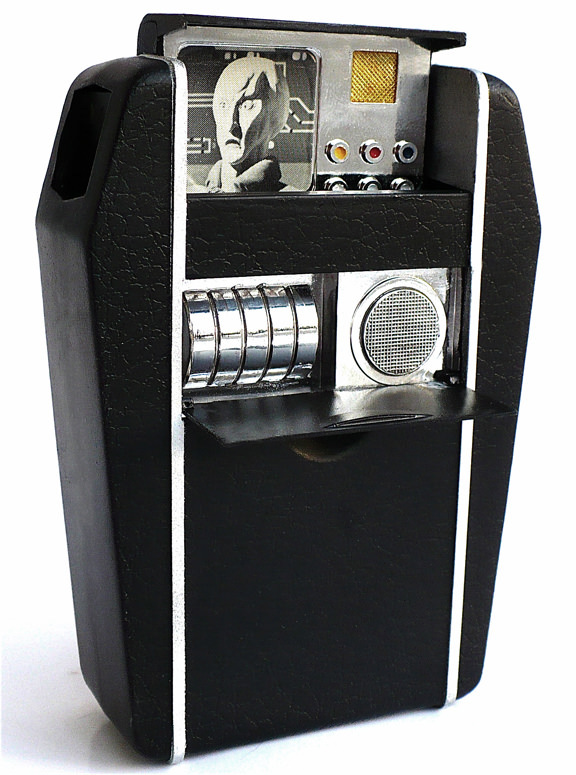 TonyO at Excalibur Productions used Franz Joseph's Tech Manual as the template for his tricorder. MechMaster (arguably best known for his "Second Empire" Dalek web-comic made with Cinema4D) added some personalized flourishes to his phaser like the trio of deep grooves, making it recognizably his work. Skipper, Marsden, Phaser Two and 2 others like this.